One of the most challenging aspect of teaching music to children is handling disruptive and off-task behavior. A perfectly planned lesson with engaging material, exciting activities, and meaningful learning objectives can turn into a moment of questioning one’s career or sanity with just a few children disrupting a class. When I was an undergrad, we learned classroom management in the Ed department, from a former social studies teacher. While he was an excellent teacher, many of his suggested techniques were difficult to apply to an elementary music classroom. 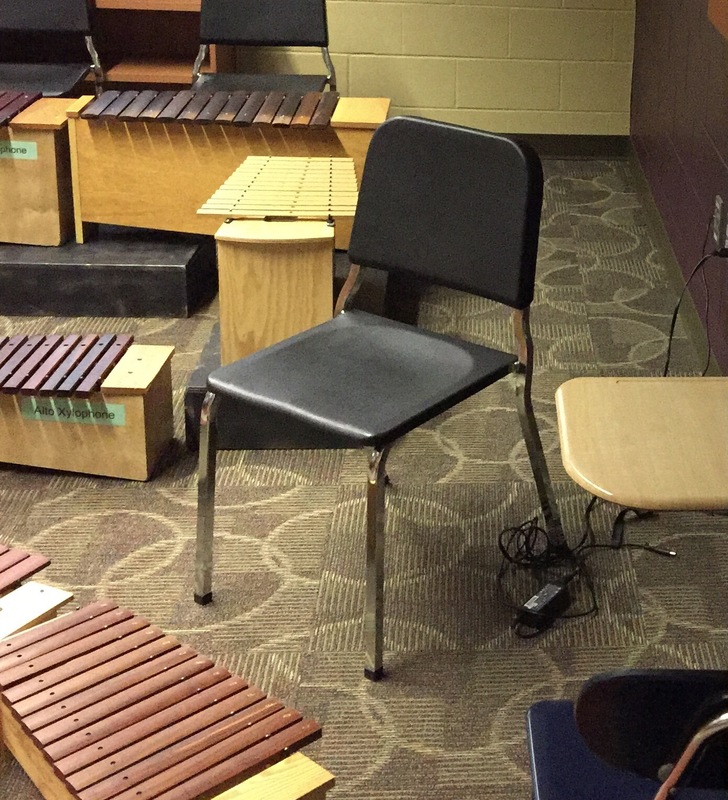 Seating is the first place where norms of most other classrooms cannot apply to a creative elementary music room. Desks and tables do not allow room for movement activities, instrument ensembles, and collaborative work. What does work in the music room? Rows – Some teachers use staff lines created out of vinyl tape (for hard surfaces) or Velcro strips (for carpet). Rows are nice for giving assigned seats and making a seating chart. This can certainly help with management issues, by separating groups that talk too much. Circle – If you ever have the chance to design a new music room, ask for a large circle in the carpet! Circles allow all students to see and hear each other, and create a natural flow into activities such as circle games, rotations, or taking turns in the center. Plus, with a visible circle on the floor, you can teach your Kindergarten classes to simply “follow the leader” to find a seat! Semi-circle – The semi-circle combines many attributes of the circle with the ability to all see to the front of the room. This is an excellent setup if you choose to use chairs or stools instead of having students sit on the floor, as the chairs can remain against the outside while leaving space in the middle. Scattered – Many activities call for students to have plenty of personal space. You can achieve this with little vinyl circles (there are several commercial options available) or by training the class on how to find their own space (stretch out arms without touching). Be sure to establish boundaries, so students don’t make choices like sitting behind instruments! At the beginning of the year, it is important to establish a routine for your students. Greet at the Door – Regardless of how busy your schedule is, there is nothing more important for setting a positive tone than welcoming students to the class. This gives you a chance to greet them, give seating or opening activity instructions, and show them you are happy to have them there. Opening Activity – Many teachers establish an opening song, warmup stretch routine, or even silent meditation as the students enter. Experiment with different routines for different age levels, but give your routine several months to see if it is helpful. The goal is to clear away baggage (frustrations, fears, anger) that the students bring with them from other classes or their home life, and have everyone ready to make music and learn. Transitions – Children are naturally excited by much of the music classroom environment. They are not naturally careful. Anytime you are changing positions, especially when moving to instruments, it is important to not only discuss but practice the transition. The time spent up front to do this will save time later. One thing that can ruin a class morale is when some students refuse to participate. Yet musical activities, especially singing and dancing, can feel very intimidating to students who are new to it. Inspire – Often you can achieve full participation by simply launching into an engaging activity, and starting with the most enthusiastic students. The first reaction to those refusing to participate can be to ignore, and focus on those having fun. See how many you can snag with an excellent lesson. One-on-One – Take aside those students who won’t participate and quietly explain your expectations, while acknowledging their feelings and concerns. Assure them that you won’t single them out or embarrass them if they are participating quietly with the class. A little heads up can really help them be prepared to be fully involved next period. Set the Class Expectation – Despite student hesitations or attitudes, the bottom line is that your class is an expected part of their education, and they have an obligation to do their job. A good strategy is to begin the year by doing a “My Job, Your Job” review of expectations. Let the enthusiastic students set the tone that everyone is expected to participate, and then hold them all to that expectation. Respect is a very vague term, that is rightly criticized by many as being meaningless to our students. However, we can teach students exactly what we mean by respect, and use it along with participation as the foundation of our class expectations. 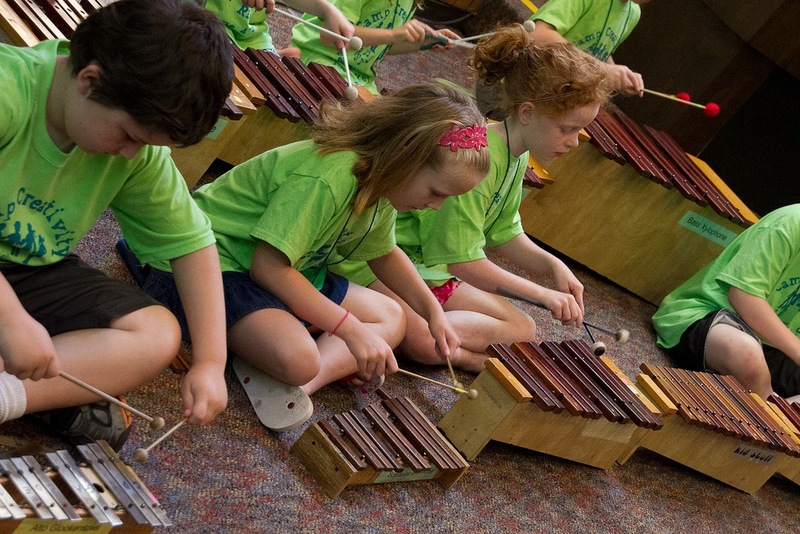 Respect the Space – Teach students how to handle instruments carefully, practicing specific tasks such as removing xylophone bars. Listen to Each Other – Describe the different types of activities in the music class. For example, if one person is talking to the group, others should not interrupt, and raised hands should be used. On the other hand, if students are asked to collaborate in small groups, it is expected that they only avoid talking over their own group. Role-playing these situations can help students understand when it is appropriate to speak. Children thrive on structure, and want to know what will happen when they don’t follow the expectations. If we don’t explain and follow-through with consequences, the students will understand that there is no authority. Keep it Simple – Consequences do not need to be draconian or cruel. Often, the best consequence is simply a “time out” or break away from the class activity. For the majority of students, this will be effective, as they will want to rejoin the class and the exciting activities you have planned. Also, whether it’s time out, writing a reflection, or something else, make sure the consequences you choose are easy to implement. If you make it difficult for yourself (such as finding students during recess to bring back in, or calling parents for minor issues), you may try to give more warnings and put off applying the consequence because you don’t have time to enforce it. Follow Up – Ask a student to stay after class, or visit with them during a time out, to discuss the behavior seen and better choices. Ask to hear their point of view, so they understand that you are listening. When appropriate (say, after 2-3 time outs for the same student), call the family and let the parents know what is going on. Discuss ongoing issues with your administrators, and ask for strategies that might work for that student. Be Consistent – It’s fine to give warnings/reminders, as long as you limit it to one. Being consistent can mean having many discussions and phone calls early in the year, but this will save you 10x the amount of teaching time later in the year. Also, be aware that students will quickly pick up on any variation in how you treat different students. While certain students may require specialized plans, be sure not to excuse minor misbehavior based on your own preferences of “good” students. The creative music classroom is filled with intrinsic rewards in the form of exciting games, instruments, and challenges. However, it is always better to praise positive behavior than have to discipline poor behavior. Verbal Praise – A simple “Nice Job!” followed by some feedback on a project can really inspire students to keep working. Sometimes we can say “I like how ____ is sitting quietly” to indirectly remind others of the class expectations. Tickets – Many schools or classes use a ticket or “buck” system, where students can be rewarded with a quick slip of paper, which they can collect to turn in later for a simple reward item. Nothing is more disheartening than the feeling of a class completely out of control. Yet most teachers will experience this at some point in their career at least once, if not multiple times. Stop and Take a Breath – It is pointless to continue on with content introduction when groups of students are being disruptive, disrespectful, or defiant. Often the simplest way to refocus the class is to stop, mid-sentence, and sit and wait. Many times the other students in the class will ask the disruptors to be quiet so that you can continue. This also gives you a new “starting point” for reminding of expectations, and a chance to identify individual culprits for using your consequence program. If a large group is arguing or talking, it can be hard to identify who should take a time out, but if you stop, get their attention, and remind them of the expectations, then you can immediately follow through with a time out for the first student that interrupts again. In order to truly have an impact on student behavior, it is essential to break it down into individual students, so that you can talk to them and their parents. Switch Activities – Sometimes waiting doesn’t work, and the class will continue to talk. Take this opportunity to find a highly-prized reward for students who are on-task. For example, send a small group of focused students to have free instrument playing time, or hand out tablets for music game time. When other students finally pay attention enough to realize what is happening, they will want to join in the positive activity. This is when you explain that these activities are rewards for focus and listening. Ask for Help – When you are overwhelmed, no one benefits. Ask your administrators and colleagues for solutions to help you get back on track. Invite the principal to come sit in the room and observe. If you do this proactively, the principal will hopefully understand that you are making an attempt, and will try to support you. What are your go-to strategies for classroom management? In my previous post, I talked about various resources for funding your music classroom. Once you have funds, it&apos;s important to know how to spend them. These are only my opinions, but they are backed up by years of experience and trial and error in several different schools. Since our money often comes in small lumps each year, it&apos;s important to plan out what to buy now, and what to buy later. If you suddenly receive a large sum from a donor, think about one-time purchases (like a bass xylophone) that are too large for your regular budget. If you only have a small amount to spend, consider what you can still purchase of value (e.g., mallets, glockenspiel, small percussion, books). I go to conferences and am always wowed by the unique, one-off, authentic musical instruments. However, one of anything, be it a piano or a digiridoo, is less useful than a class set of something. When you have one, you have 20+ students waiting for a turn to try it. There goes your class period, and the students sat and waited for most of it, not learning. When I&apos;m exploring rhythm with students, it&apos;s wonderful to have a set of hand drums, so everyone can learn the same technique and play together. Similarly, for melodic exploration, nothing beats a full set of barred percussion. Of course it is possible to create rotations wherein each student takes turns but on different instruments. However, when looking to teach not only rhythm but technique, timbre, and dynamics, a homogeneous set is ideal. Back to rule #1, remember that building a class set of instruments takes time. If you can buy 1-2 instruments every year, you are making progress. One idea I didn&apos;t mention in the previous post was to borrow instruments, use them in performance, and then ask for money to help purchase them! Pretuned hand drums – Look for a set of stackable drums of various sizes. Make sure the larger ones aren&apos;t too heavy for your students. Barred Percussion – Xylophones with rosewood bars are the gold standard. There are some high quality fiberglass bars that sound almost identical. Metallophones are beautiful in small numbers, but overwhelming if too many. Glockenspiels are excellent for a high end. Look for balance between voices. Recorders – You need at least a full grade set, or find out if students can purchase their own. Make sure they don&apos;t buy the very cheapest!!! Also, there are baroque and renaissance models, with different strengths and weaknesses. I like the ease with which students can play low notes on a renaissance recorder. Ukuleles – For older students, the ukulele is a very versatile chordal instrument that fits kids hands and sounds good with their voices. The axiom "you get what you pay for" is very true for musical instruments. With limited budgets, we&apos;re always searching for a deal, but make sure you have the opportunity to play anything you plan to buy. Come to the AOSA conference or a state convention, and visit the exhibitors. Ask questions of veteran teachers, what they like and don&apos;t like. (If you want my personal brand preferences, message me). With all of the books and software I&apos;ve written, the goal has always been to make my job as a music teacher easier, and to save time from boring tasks while making more time for playful, hands-on learning. Be wary of materials that do the opposite – entertain students passively while taking up class time. Our children are surrounded by digital entertainment every day, they need more from us. We need to maximize creative skill-based activities in the limited time we have. Yet there are certainly requirements in music education that technology can help with. Getting an accurate and documented assessment of student skills, for example. I can take time to pull out my gradebook and hear every single child clap a rhythm, or I can use a tool like Unison.School&apos;s rhythm assessment to test an entire class in 5 minutes, and be able to pull up their scores anytime. Likewise, lesson planning can be an exhausting process. Whether you use a simple spreadsheet, document, or online planner, technology allows us to simplify this task. Whatever you decide to purchase for your classroom, use it to inspire students to become lifelong musicians. Let me know what you find useful for your classroom! One of the most amazing and frustrating things about U.S. schools is the wide variety of support for music education. While some children have music on a regular basis, others receive instruction every few weeks or not at all. Even when looking at schools that have reasonable schedules and full-time music teachers, there is a huge discrepancy in instruments, resource books, and other materials. While music budgets range from $0 to hundreds (or on rare occasions thousands), the first rule is to always spend what you&apos;re given. Assuming you don&apos;t have the perfect classroom with barred percussion and drums for every child, there&apos;s always something to buy. If you don&apos;t have a budget, or it is ridiculously small, you should still present your administration with your needs every year. Often, principals have a building budget that can be flexed to where needs are, and by politely making your case, you become part of that process. It&apos;s the old "squeaky wheel" cliche, but it&apos;s absolutely true. And of course, this speaks to why developing a positive relationship with your administrators is so important. ften have flexible money, so do districts. There is danger in being seen to go over the head of a principal, but if you are fortunate enough to have a district music or arts supervisor, or have a personal relationship in the central office, it never hurts to let them know your needs as well. In some districts, the majority of funds flow from the arts director instead of the principals. This is one area that is often overlooked. Districts normally have a curriculum/textbook budget that is separate from the building budgets, and is used in a rotation to supply new textbooks to various subject areas and grade levels. While some districts may reserve this for only "core" subjects (although according to the ESEA act music is a core subject), there is plenty of precedent for including the arts in this rotation. Even though this money is used traditionally for textbooks, our education system is slowly adapting to online resources. For music teachers, curriculum money would be useful for software services such as Unison.School, or even to provide the instruments needed to teach your curriculum! When district budget options are exhausted, the next step is to talk to supportive parent groups. This can be the building PTO/PTA or a music booster group. These organizations can normally make only concrete supply purchases, but they are often very open to suggestions on how they can help the school. If their children love music, they will want to support you. Many cities and regions have local non-profit organizations devoted to supporting the schools. Like PTOs, they are made up of local concerned citizens and parents, looking for opportunities to help out. Grant applications can seem daunting, but the trick is to dive in, and have a clear image in mind about how the resources will impact your students. They are also often looking for particular catch-phrases, such as STEM/STEAM. Since acoustics is a science that can be studied by the vibration of an instrument, there&apos;s always a way to tie things together! Large companies such as Target offer school grants, as well as professional organizations like the American Orff Schulwerk Association. Like local grants, you need to detail your project&apos;s goals. However, since these groups may not know you as well, it&apos;s also important to explain why your school is in need. Finally, many teachers have had success with Donors Choose, the crowdsourcing of school funding. This allows you to specify materials you need, and go directly to social media and a national network to ask for support. Be sure to check with your district on their policies, as you may need permission first. So what did I miss? How have you funded your music program? I’ve been blessed to have contact with teaching colleagues from many different states this summer, through my work as an Orff Schulwerk Pedagogy instructor. One topic that often comes up is the requirements of assessment in various districts around the country. First, let me assure you, there is no consensus. I have taught for many districts where the administrators are far too busy to worry about the music teacher and their assessments, and the teachers are free to plan assessments around their own teaching and their students’ needs. Other districts require one or more district-wide common assessments, sometimes referred to as SLOs, SLAs, or CFAs. In some states, these standardized assessments are even used to evaluate teacher quality. Since my district was simultaneously adding common assessments to other subjects like Math and Reading, we were able to make the case that the assessments should be proportional to the amount of instructional time available. Let’s say an elementary math class takes one common assessment per week (which seems like a lot to me, but is not unheard of). In Iowa, many students have math for 60 minutes per day. That’s 60 x 5 or 300 minutes of instruction for each common assessment. No wonder some of these teachers are ready to quit. No wonder they don’t want to do creative, in-depth, student-centered, engaging lessons that take months to develop, despite the fact that every evidence suggests this is what students crave and need from a music program. They are literally forced to turn music class into a boring drill and test class. One reason I started Unison.School was to help teachers quickly assess their students. The rhythm assessment that I created there can be quickly taken by students with access to any device: tablet, laptop, or desktop. Teachers can rotate students back to a few devices while continuing instruction, or bring in a class set of devices and test everyone within a 5-10 minute window. Students enjoy the “game” of the test, and class continues on quickly. Teachers have access to all the scores without typing or writing down rapidly as the students work. But even with digital solutions like mine, testing every day in music class is completely inappropriate and unwarranted. We must establish some sanity around the amount of time spent assessing compared to instructional time. Even the U.S. Department of Education recognizes this. According to their Testing Action Plan from 2015, they state that standardized testing should be no more than 2% of instructional time. Even though this refers to state-mandated standardized tests, the number 2% is the only guide I can find to refer to any assessments, and I think it’s a good start. Obviously, informal formative assessment happens minute-by-minute in the music classroom and elsewhere. I am not suggesting this should stop. Rather, we should limit assessments that interrupt instruction to a reasonable percentage of class time, say 2-5%. If you are in a district that is struggling with this issue, I would love to hear from you, and please feel free to share my thoughts with your administrators (I’d even be happy to contact them myself if you want). We must all fight for sanity and a quality music education in our school programs. I am just about two weeks into the first summer of my post-teaching career. What was my part-time enterprise of app-writing for the past three years is now becoming my full-time endeavor. I started out with an interest in iOS apps. I’ve been a big Apple fan since the first iPhone, and always wished there was a way as a teacher to keep track of my classes and lessons on my phone. So I created a lesson-planning and calendar app specifically for music teachers. I had to teach myself the Swift programming language, how to save and access data from a server, and many other new skills. (This wasn’t really my “first” tech, as I’ve been running WordPress websites for years). After finishing my planning app, I taught myself Java and converted the entire program to Android. 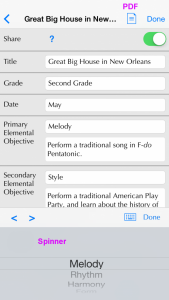 Then, I followed up with a pocket xylophone app and a staff music player app, for students and teachers who either don’t have access to an instrument, or have a disability that interferes with playing. This past winter, as I was making the decision to take a break from teaching, I decided that if I was serious about making a living on software, I couldn’t be writing every program for each device separately. This led me to Xamarin, which is built on Microsoft’s .NET platform in C#, and allows you to create apps for iOS, Android, Windows, and Mac with a lot of shared code. Once I had a foot in the Microsoft world, I realized that I could make not only apps, but websites and web apps with this same language! This is when I started to build Unison.School, which will be the home of my future music-teacher offerings. 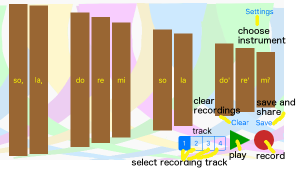 I’ve created an online xylophone, piano, and staff player, which is free for everyone. I’m also building a set of assessments for schools to use to quickly check and record student skills. You can see the first grade rhythm example online now. Of course, there’s always more to learn. I spent an entire week building up a login, registration, and subscription model, so that teachers can use the services when I launch them. Yesterday, I began teaching myself how to do unit tests, which are automated tests that ensure your code is working well. It’s definitely frustrating if you find yourself not making progress for 2-3 hours, but there’s always a breakthrough eventually. And I have to admit, I’m loving working from home, at my own pace, and by myself. When I started programming professionally two years ago, being an Apple fan, I rode the Swift wave. It was clear, easy to understand, and seemed beautiful compared to Objective-C, which I never really learned to use, but can read well enough. With my first few apps complete in the App Store, I had the itch to learn more, so I turned to Android and Java. The transition was surprisingly smooth, and I discovered that Java and Swift have more in common than not. Sure, there are some frustrations, like needing to remember ALL THE SEMICOLONS!!! And there are way too many different types of objects. I mean, there’s Integer AND int. String AND string. What? By the time I had completed several Android apps, I understood the concepts now and how they came about. I even made a post about iOS/Swift and Android/Java conversions to help those who were following a similar path. Sure, Swift was simpler, but it is also (for now) Apple only. While looking for a multi-platform approach to programming, I explored RemObjects Elements compiler, which lets you code cross-platform in Swift! At first I was ecstatic. However, I soon learned that this was a DIY solution with not enough support for a still support-needing newbie like me. While the tools seem to work as advertised, the debugging and setup were confusing to me. I would try it for awhile, give up, come back a month or two later, try again, and still ended up giving up. Meanwhile, I decided to move on and explore desktop environments. Transitioning apps from iOS to MacOS was both easier and harder than I expected. The code re-use was amazing, but the difference in methods on classes with the exact same name drove me nuts! Next, I delved into Windows-side, with Visual Studio, C#, and UWP. C# is very similar in syntax to Java, which made this transition fairly painless. It was fun to see the three (Apple, Android, .NET) different approaches to UI. Apple’s Storyboards are great for beginners, because there’s literally no coding involved at first, just drag and drop. Yet when you want to make fine-tuned changes, I find XML (Android) and XAML (.NET) simpler to understand, since you can see the visual AND the code side-by-side. Having already worked on websites for years, the syntax of XML/XAML is similar enough to HTML to pick up right away. Finally, I learned that the Xamarin tools for Visual Studio were now free to try and use for individual programmers! With Xamarin I can make an ASP.NET web-based app, with partner apps on mobile devices, and share a single code base for the business logic! The only thing that needs to be tailored to each is the UI. (Note: I know that Xamarin.Forms is a cross-platform UI builder, but I have heard less than positive reviews, and I’m going to stick with building native UIs for now). So, what am I building? Well, I’ve been a teacher all my life. I would like to build solutions for other teachers and schools, to help teachers quickly and effortlessly do the paperwork tasks they need to do, and free them up to spend more time face to face with students. Stay tuned for more info! My son is in upper elementary, and his school day looks amazingly like my school day back 30 years ago. A bit more computer work, more time spent testing and reading, and unfortunately less social studies (and possibly science, although I’m not sure elementary students ever got all that much). But they still have home classrooms, arts and phys. ed. classes a few times per week, lunch and recess. Despite all the hubbub of “Common Core Math”, his homework assignments are not completely different from what I was given. As a lifelong educator, union member, and public school supporter, there is something encouraging about this incredible length of stability in our system. Yet as a person who embraces, studies, and works with technology, I am concerned with the future, and what it brings for public schools. Teachers are constantly asked by administrators to demonstrate how they are “incorporating” modern technology into their teaching. Many of us will point to the students typing away on computer keyboards instead of hand-writing assignments, and teaching them to use simple applications. Yet the real technological disruption in education is perhaps still to come. Within the past year, I have taught myself, at home and online, how to be an app programmer for iOS and Android. I paid for no schooling, and required no tools except a Mac laptop. I learned quickly and efficiently because I was self-motivated and studying something I loved. Imagine if this type of self-guided study truly catches on with our children. Already, many kids are learning to program mods (modifications) for the popular Minecraft game, or creating and sharing games using block-based code on scratch.mit.edu. Companies such as IXL have complete home-testing programs in math and reading. Homeschool parents probably are more familiar with the vast online choices than I am. Certainly, current apps and websites require a teacher or knowledgable parent to guide students in the learning process. But I have little doubt that the technology will continue to improve, to the point that digital assistance will serve most of the current mentor’s role. Would this mean the elimination of schools as we know them, and the teaching profession? Obviously, not every subject matter lends itself equally to a digital medium. Physical education, art, music, social skills, will likely be among the last holdouts for human contact. I could see schools becoming more community-centers, where children and families gather to share and learn together, before returning to their homes to continue their studies online. I also think it likely that this transition will continue to erode universities, then high schools, with elementary schools being the last to be dismantled from their current structure. I don’t want my teaching colleagues and future teachers to be out of work. I don’t want students to become automatons who can’t interact with other humans. But not wanting this to happen doesn’t mean it won’t happen. And fighting disruptive technology has proven nearly impossible in every other field. I believe 50 years from now, we will have fewer teachers, fewer schools, and more digital education. I think we should talk about how we get there without ruining teachers’ lives or trusting faulty software that isn’t ready to be as effective as those devoted teachers. And I think, as educators, the time will come, sooner or later, when our old saying, “do what’s best for kids,” will point not at us, but at our machines. Hello IMEA friends! Below is the link for the slideshow in today’s presentation. And here are email links for the presenters. Feel free to email any of us with questions. Feel free to check out my other music teacher resources, such as the Creative Sequence book series and Music Teacher app!